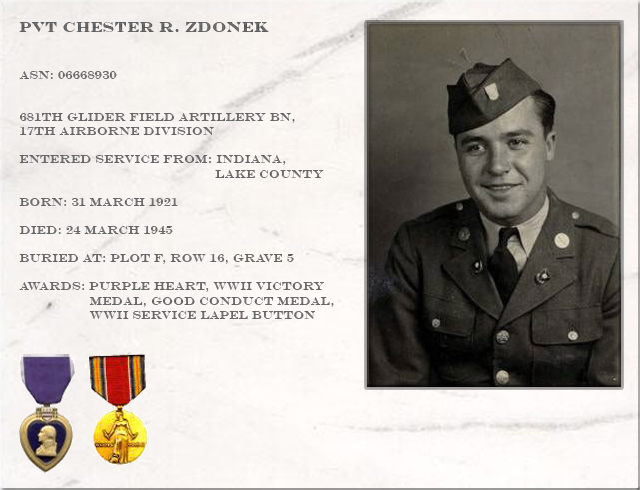 Chester Ramon Zdonek was the son of John (Jan)Zdonek and Franciszeka Parda. His parents came from Poland around the turn of the century. At his birth Chester was named Ramon but for some reason he called himself Chester. He had a sister named Ann and three brothers named Charles, Joseph and Peter. His mother died very young in 1933. After finishing his education at Froebel High School Chester enlisted in the Army on April 17, 1942. In 1943 he was transferred to the paratroops. 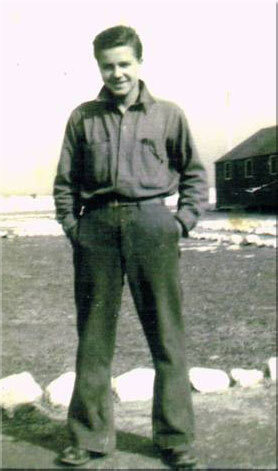 With the 681st Glider Field Artillery Battalion, 17th Airborne Division he served as a radio operator and was sent to Europe in July 1944. When the 17th Airborne Division arrived in England, the battalions were immediately shuttled to the staging area, Camp Chisledon. Flight and tactical training continued and night maneuvers were added to the training schedule. When Operation Market Garden was initiated on 17 September, the 17th Airborne Division was still in training and was held in strategic reserve. On December 16, 1944, the Germans launched a surprise counter-offensive through the Ardennes Forest which caught the Allies completely by surprise. The 17th was still in England. But the 82nd and 101st Airborne Divisons were in Sissones, France and were rushed by truck to contain the bulge in the Allied lines. Between December 17 and 23, the Germans were halted near St. Vith by the 82nd Airborne and Bastogne by a roadblock, defended by the U.S. 7th Armored Division and the 101st Airborne Division. To help reinforce the siege at Bastogne the entire 17th Airborne Division was finally committed to combat in the European Theater of Operations. Upon arriving the 17th Airborne Division was attached to Patton's Third U.S. Army and ordered to immediately close in at Mourmelon. On 2 January 1945 the 17th Airborne moved to Neufchateau, Belgium. In early February 1945, the tide of battle was such as to enable an accurate estimate as to when and where the 2nd British Army would be ready to force a crossing of the Rhine River. As General Eisenhower watched the operation from a church tower on the west side of the Rhine Chester and the men of the 681st GFAB had the misfortune of flying over a concentration of German antiaircraft weapons. Two-thirds of the C-47's were either damaged or in flames. The pilots remained with the aircrafts until they released the gliders which landed amid German Artillery units. It was a fluid situation for a period but the glider troops prevailed and were able to overrun the German positions. 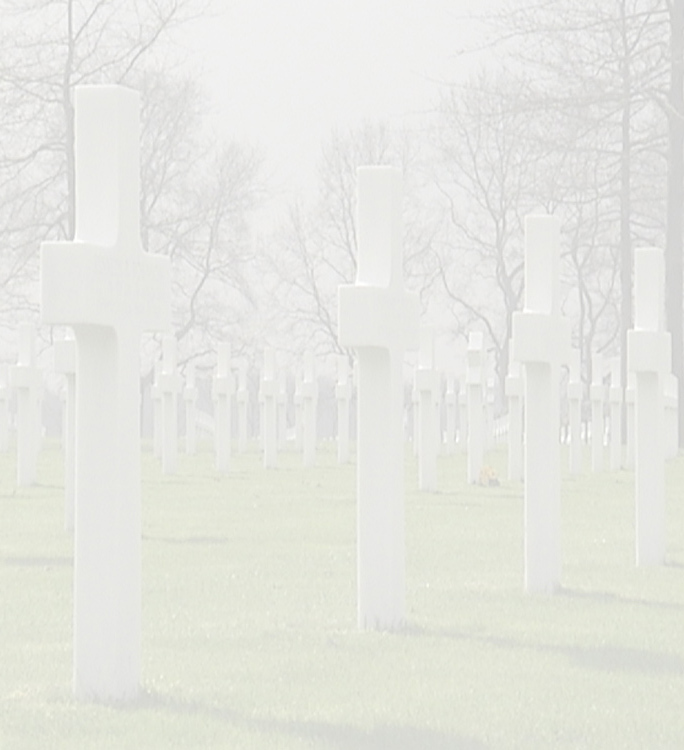 By mid-afternoon on 24 March 1945 after sustaining high casualties, the 681st had secured its objective. 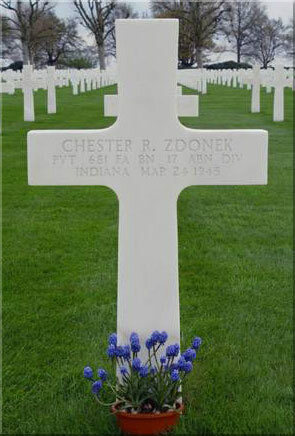 Mrs. Kaleen Follow, Pvt Chester R. Zdonek was her husband's great uncle.